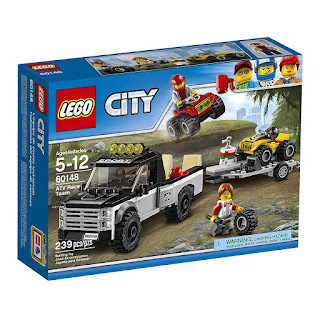 Head over to get this LEGO City ATV Race Team for ONLY $12.99 (Retail $19.99)! Get ready to race with the LEGO city ATV race team. This great vehicle-themed toy features two ATVs, a pickup truck, trailer hitch, pickup bed with adjustable ramp and a detachable trailer with adjustable ramp, plus helmets, fuel barrel and a spare tire. Includes two minifigures.